We have been writing about Social Media, Inbound Marketing and Customer Loyalty. Let’s have a look today specifically on (using) WhatsApp. Although we use WhatsApp as our Business Case Example since almost everybody is using it, all things mentioned here are applicable for any other Dark Social setup. But, what is Dark Social? Have you shared an article/ URL (maybe one of our own?) with WhatsApp? Or with an email? Then…. Congratulations! You have been an active element in the “Dark Social. The term “dark social” was coined in 2012 Alexis Madrigal at the Atlantic Magazine) Madrigal loosely defines Dark Social as all social traffic that is essentially invisible to most analytics programs. Basically Dark Social is when we do share any kind of content through private channels such as any Instant Messaging platforms (Yahoo Messenger for example) or messaging apps (like WhatsApp or Viber) and email. According to estimates, Dark Social is accountable for about 84% of all outbound sharing (source this 2016 report https://radiumone.com/darksocial). Strangely enough, so many Social Media Marketers, do not realize how big of a slice the Dark Social has (of the whole Social Media sharing pie). So, the obvious question is: can you harness it for your business? Here’s everything you need to know. We have all shared and are sharing articles / photos/ videos/ songs one-on-one through a means other than the classic Social Media. Basically, Dark Social describes any web traffic cannot be attributed to a known source, such as a social network or a Google search. Referral traffic is usually identified by certain “ids/ -tags” attached to the link whenever a URL is shared. The mechanics of this are beyond the scope of this article. Dark Social links, do not contain referrer data. Whenever you copy and paste a URL into an email or instant message, or even share via classic SMS no tag is automatically attach to your sharing (ok… to be honest, if you were to copy the URL of an article that you originally found on Twitter, including the UTM parameters attached to it, you will have ‘included’ tagging). Is the Dark Social measurable? Yes and No. There are tools that you can buy, but none of them is 100% accurate at present. The simplest thing/ trick you can do at the moment is to use abbreviated URLs (like bit.ly for example) and get some analytics is that option is offered to you (usually at a fee). Why WhatsApp as a case for Dark Social Marketing. ….and 1.6 billion photos a day. The WhatsApp platform supports 53 languages, which makes it a powerful marketing tool. If as a business- owner or entrepreneur, you haven’t considered WhatsApp Marketing its time to start reviewing your marketing plan. Constant communication with your clients is the key to brand awareness and delight. Now, before you run off to create a WhatsApp platform for your business, there are certain key- things which you must consider. Most business- owners and entrepreneurs usually hit these pitfalls therefore they get to clear these thorny issues out of the way, before instituting a WhatsApp marketing platform/campaign. The Toyota Company in 2012 had the brilliant idea to take advantage of one of the functions of Whatsapp to promote their proposal through a contest. 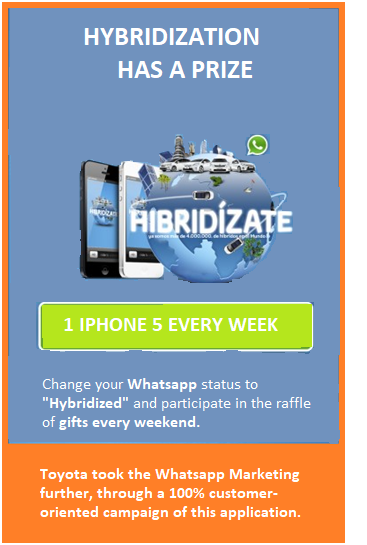 To participate, people should have put the word “Hybridized”in their Whatsapp Status. Whatsapp has a 70% opening rate, which means you are almost guaranteed exposure of your message if you customer is on whatsapp with you. Again, please have WhatsApp in mind, but these apply to any Dark Social area. It is imperative that your display photo has a clean and clear picture of something that represents your brand. Therefore ideally, your WhatsApp image must have a photo of the business- logo. If as a small business you don’t have a logo yet, images of what you do should be used as the display picture so that when a conversation is initiated or a message is sent, it could help a potential or existing customer to easily identify your business. For example, a 2nd-hand car- dealer whose business does not have a logo, can use an image or a collage of the dominant car brands for which his core customers know him for. Your WhatsApp marketing content must not only consistently talk about your brand promise and how it solves problems. If that is what the customer constantly receives, they might get bored easily and not bother looking at messages when you send them. Therefore your content must be a mix of new product offerings, special offers and discounts, insights into your business and experiences of other customers etc. Basically, do please research further into the term ‘Branded Content’ and find ingenious ways you and your team can create branded content which does not get stale easily. Research by social media analytics firm Social Bakers shows that people interact better with images and videos. Your content has to be signed in order for clients to know where the message is coming from. Especially when your brand is not easily recognizable from your display photos. Details of the signature can include your name, the full name of the business, what you do and where it is located. This feeds into the first point of having a unified brand. This point cannot be over emphasized, there will be ‘die hard’ customers of your product who might request you to form a group for them to share their experiences and joys of using your product. When that happens, please celebrate because it one of biggest opportunities your clients have given you. But in your excitement, be mindful! There must be strict time- limits to the content/ messages you share with your clients. If you create a Broadcast List, you can only include 255 contacts. If you create a Group, you cannot be ‘missing’ when users ask you questions. You should pick-up your calls. And that can be overwhelming. You need to constantly provide high quality content. Although Facebook acquired WhatsApp in 2014, there is no way yet, you could create marketing campaigns or any kind of advertising actions, like it is possible on Facebook. And of course, the best way to ensure your content gets shared is to create interesting, informative, original material. Content is the King. Both Kwaku Abedi and Spiros Tsaltas are associated with a unique Customer Loyalty PR Startup : HireLoyalty (www.HireLoyalty.com)- based in Accra, which offers both Consulting, analytics and Training in anything relating to Customer Loyalty and PR.